Time has positively flown by these past few months—I will be done with my first year at Otis in just under two weeks, and Jonji only has one more block, or five-week-long section, to go until he’s done with his first year of medical school. Big things are a-happenin’ down here in LA! A couple of weeks ago Jonji and I made our first beach appearance in a few months. 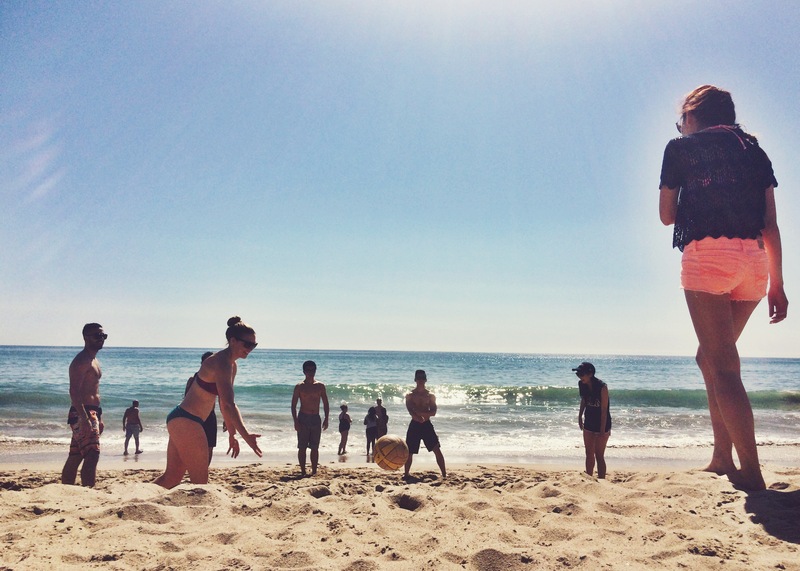 We joined a group of his classmates on a lovely Friday afternoon to play a little volleyball, frolic in the waves, and lounge on the sand. After a good hour or so of socializing, I sequestered myself in the pages of my book and proceeded to read for the rest of the afternoon. Unfortunately, a bee was so jealous of my enjoyable situation that it decided to commit suicide on my calf, leaving half of its body sticking out of my skin. Bee sting number two in the books! Over the course of that weekend, the sting site proceeded to swell up like an angry pufferfish and itch like crazy. I even got pitting edema (the best part of having a medical student for a boyfriend is clearly the vocab), which was a rather unsettling experience. Seeing that my first ever bee sting had barely phased my adolescent self, I was surprised at the reaction this one gave me. According to the internet, I am among the 10% of people who get intense localized reactions to bee stings. Excellent. 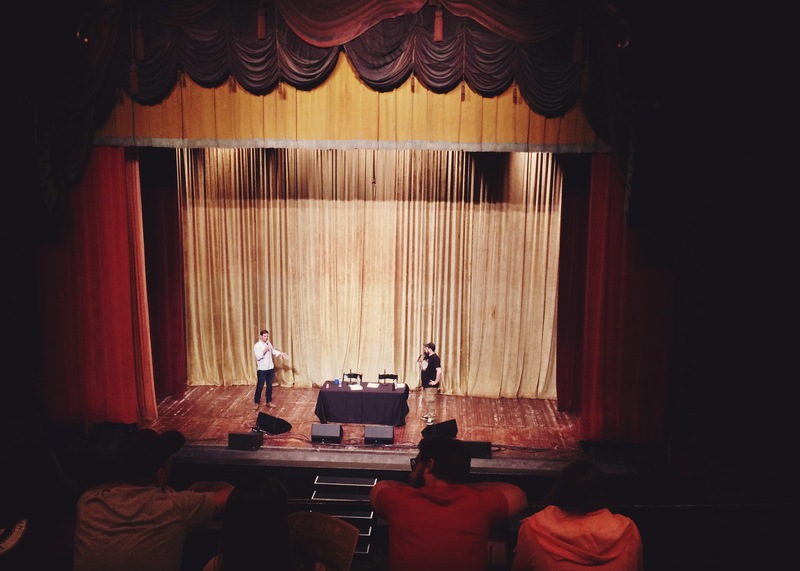 The Monday after my bee-sting filled weekend, Jonji and I paid a visit to Downtown LA to see the Stuff You Should Know Live Podcast. At 10 PM, I might add! That’s what I call livin’ large. When we got there we saw a line trailing around the corner full of people waiting to get in to the theater—a surprise to me, since it was a Monday at 10 PM and it was a live podcast. The show itself was better then I thought it would be: Chuck and Josh were absolutely hilarious, as well as informative. If you haven’t listened to the podcast, I highly recommend it! And no, they are not sponsoring this blog post. Last weekend was Second Look for the incoming UCLA medical students, which Jonji had a large role in running. The weekend is a chance for accepted students to decide whether or not they want to commit to UCLA for the next four years, so Jonji and his fellow classmates had the job of making the school look good enough to warrant such an important commitment. This meant that I didn’t get to see Jonji that much over the course of the weekend, but I did get some free tacos at their Saturday night social event, the only event I attended. Score! I also had plenty of time to read my new book, called The Name of the Wind by Patrick Rothfuss. After recognizing our shared love of Lord of the Rings, Jason Dupere had recommended the book to me as an extension of my fantasy education. He was right to think I would like it—I haven’t done much of anything except read in the past few days! If I could stay home all day and read, I would. I also realized that I’m a fully atypical college student: if you asked why I was excited for summer break, I wouldn’t say anything like “sleeping in” or “late nights with my friends.” Nope, instead I would say “so I can read my nerdy fantasy novel all day long.” I feel like the winner in this situation. My friend Alaura and I made a stop-motion video for a class project, which I have posted below. I thoroughly enjoyed making stop-motion, but I also now fully appreciate how much work it takes to make a professional stop-motion video. Not that ours is close to being professional. Oh, and that is the Mordor theme song at the end of the video. I also interviewed at a digital agency last week, which was a new experience for me. Fortunately (and, I guess, unfortunately), there was little pressure because they told me ahead of time that they didn’t have an open position for me right at that moment, but to come in for an informal interview anyway. However, I was still sweaty-palmed and frantic by the time I found the place (twenty minutes early, I might add), trying not to slow traffic down too much as I searched for the entrance to the underground parking garage. Once I had found the right floor, I managed to bungle a few sentences with the man at the front desk, then sit on the low couch while I waited for my appointment. I stoically (and stupidly) refused water three different times, which I thoroughly regretted once I was sitting in the conference room with an exceptionally dry mouth. Luckily, the man I met with was very personable and kind, so I managed to stop sweating so profusely. All in all, the experience was great practice for me, and a step in the right direction. I am posting this recipe not because I made it recently, but because I wish I was eating a slice right now. It is also a recipe that I feel all cooks should have, since at some point in life (if that point is everyday like it is for me, just know you’re not alone) you’ll want to make a pie. If you must know, my favorites are blackberry and olallieberry pies, but I still enjoy apple pies, pumpkin pies, mixed-fruit pies… You get the gist. 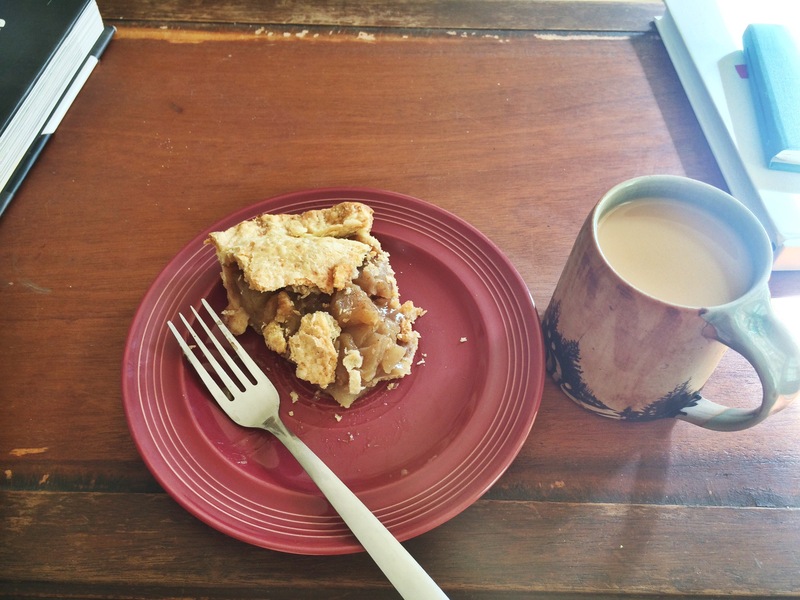 To me, pie is the ultimate comfort food. The warm, delicious scent wafting off the top of a freshly baked pie is sure to lift anyone’s spirits. And hey, just because there’s no holiday in sight doesn’t mean you can’t bake a pie! Trust me, your friends and family will welcome the change. And if they don’t, they’re just plain crazy. Note: This recipe contains a multi-use pie crust—it’s not just for apples! Substitute any fruit you desire; look up a few recipes if you’re unsure about the ratio of other ingredients. Stir the flour, sugar, and salt together in a medium bowl. Add the butter and toss to coat in the flour, then pinch every cube flat with your fingers—don’t work the butter any more than that. Stir in the cold water and knead just until the dough comes together in a shaggy ball. Dust your work surface with flour. Roll the dough into a large rectangle roughly 10×15 inches, dusting with more flour as needed to avoid sticking. With the longest side closest to you, fold each shorter side to meet in the middle, like the pages of a book. Fold the whole thing in half from top to bottom, then slice in half horizontally across the “waist” so that you end up with two equal rectangles. Pat each into a rough disk, then wrap with plastic wrap or parchment paper and chill in the fridge for at least 20 minutes. If need be, the dough can be chilled for a day or two—just be sure to take it out 15 minutes before you plan on using it so that it won’t be too stiff to roll. For the filling: Core each apple and cut into 1/4 thick slices. 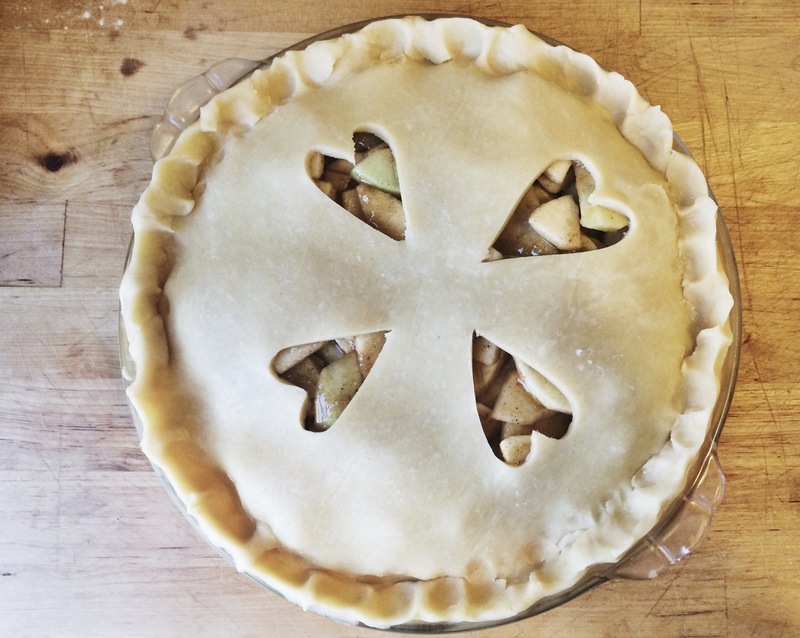 If you like smaller chunks of apple in your pie, cut each apple slice in half horizontally. Toss the fruit in a large bowl with the lemon zest and juice. In a separate bowl combine the sugar, cinnamon, nutmeg, allspice, and salt. Add the dry mixture to the fruit and toss to combine. Set aside. Make the pie: On a lightly floured surface, roll out one of the chilled disks of dough until it is about 1/8 inch thick, or thinner. Drape the dough carefully onto a 9-inch pie plate (I like to use a glass one so as to see the dough brown as it bakes)*. Press the dough lightly down into the pie plate. Cut off any huge amount of excess dough around the edges, but leave a bit of an overhang. Roll out the other disk of dough the same way as the first. Pour the fruit mixture into the prepared pie plate and spread out evenly. If you should so desire, cut holes or a pattern into the dough “lid” before transferring it to the pie. Drape the dough over the top of the pie carefully. Fold the lower overhang of dough over the top and pinch, doing so all the way around the pie so as to crimp the edges. Sprinkle a little sugar on top. If you want to brush the top with the egg wash, do so before sprinkling the sugar. Place pie in the oven, with an empty baking sheet on the rack beneath it in case some juice drips over. Bake for 25 minutes, then turn the heat down to 375°F and bake for another 40–50 minutes, until the top is golden brown. If it’s browning too much, drape the pie with a little foil and continue baking. *If you’re unsure how to do this, I suggest watching a couple videos first—it’s really not that hard once you get the hang of it.